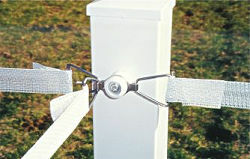 SAFE-FENCE Tensioners are the cornerstone of the SAFE-FENCE Hardware System. Of solid stainless steel construction, SAFE-FENCE Tensioners hold your fence firmly, yet in instances of violent impact they are designed to protect your horse. Begin and end each strand with a R-40 at gate posts or buildings. 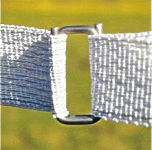 Holds webbing tight and allows easy retightening. Use the R-50 at all corners or any up and down hill direction change greater than 10 degrees. Also used at tape gates. The R-55 has three tensioners. Use for cross fence junctions. A stainless steel spring buckle similar to the tensioner. Used to join rolls of webbing or repair torn webbing in minutes.